FLORENCE, Ala. – Local entrepreneurs Max and Katie Beech will be speaking at the University of North Alabama Generator, Feb. 12 at 6:00 p.m.
Max is the Creative Director for Highland Park Baptist Church and a graphic designer and artist for PlayStation Creative Studio. Katie is the owner of Katie Jewell Photography specializing in wedding and portrait photography. The Beeches are Shoals residents, but travel nationally. A workshop titled Podcasting 101 will be offered at the Generator on Feb. 18 at 6:00 p.m. This workshop will who you how to start your own podcast, what makes a great audio story, how to use recording and editing tools, and how to publish a podcast. The audience will be the stars of a live podcast during the workshop for The Generator Student Business Incubator. The Generator is located at 204 W. Tuscaloosa Street on the corner of Tuscaloosa and Pine Streets. No reservations are required. 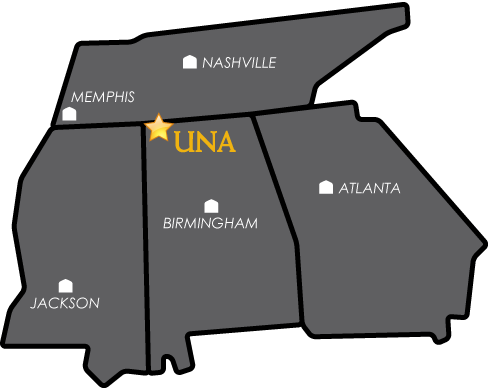 The Generator is UNA’s student innovation incubator. Its goal is to assist UNA students, regardless of discipline, who desire to start a business or commercialize their innovations with resources and expertise.